The MIMAROPA Region proved to be the showcase of the Philippines’ responsible and sustainable mining practices as Bataraza, Palawan-based Coral Bay Nickel Corporation (CBNC) and Rio Tuba Nickel Mining Corporation (RTNMC) bagged the prestigious 2018 Presidential Mineral Industry Environmental Award (PMIEA) for mineral processing and surface mining categories, respectively. CBNC reaped a rare five-peat in the said PMIEA category, along with the 2018 Safest Mine Award (Mineral Processing – Extraction) and 2018 Best Mining Forest Award (Mineral Processing). A winner of the first ASEAN Best Practices in Sustainable Mineral Development Award in 2017, RTNMC also received the Safest Mining Operation Award for this year. 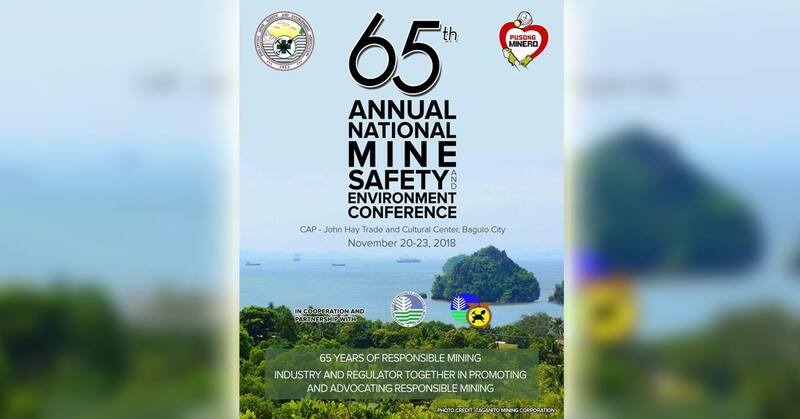 Meanwhile, Palawan-based lime manufacturer Unichamp Mineral Philippines Incorporated (UMPI) took home the 2018 Safest Mine Award (Mineral Processing – Calcining Plant), while Mindoro-based Aglubang Mining Corporation (AMC) emerged as the winner for the 2018 Best Mining Forest Award (Mineral Exploration). “These companies have been consistently reaping prestigious awards mainly because of their strengthened cooperation with government regulators such as the Mines and Geosciences Bureau (MGB), and strict compliance to environment and mining laws,” said MGB MIMAROPA Regional Director Roland de Jesus. “In the MIMAROPA Region, we are aiming to instill in the companies a culture of responsible and sustainable mining that is geared towards a higher level of self-regulation – something that will carry on from one generation to the next,” RD de Jesus added. Concluding the four-day 65th Annual National Mine Safety and Environment Conference (ANMSEC) in Baguio City, the Testimonial Dinner and Annual Awards Night aims to recognize the environmentally and socially responsible exploration, mining, and mineral processing operations in the country pursuant to Executive Order 399 Series of 1997 (Establishing the Presidential Mineral Industry Environmental Award). Department of Environment and Natural Resources (DENR) Secretary Roy Cimatu graced the awards night, joined by Chamber of Mines of the Philippines chairperson Gerard Brimo, Philippine Mine Safety and Environment Association (PMSEA) president Walter Brown, and former PMSEA president Engr. Louie Sarmiento. Themed “65 Years of Responsible Mining Together in Promoting and Advocating Responsible Mining,” this annual event also highlighted the Mining Exhibit, fourth NAMINA Congress, 6th Community Relations Officers Conference, Minerals Industry Symposium, Minerals Industry Parade, and Mine Safety Field Demonstration and Field Competition.